Many of the projects we design at Archadeck of Central Georgia consist of improving upon an existing outdoor living space. Whether it is redecking an existing deck from wood to low-maintenance composite, a redesign to better suit the needs and tastes of the homeowner or just updating a porch to add modern appeal, we do it all. Our most recent screened porch update proves the power of modernizing an existing outdoor living space. 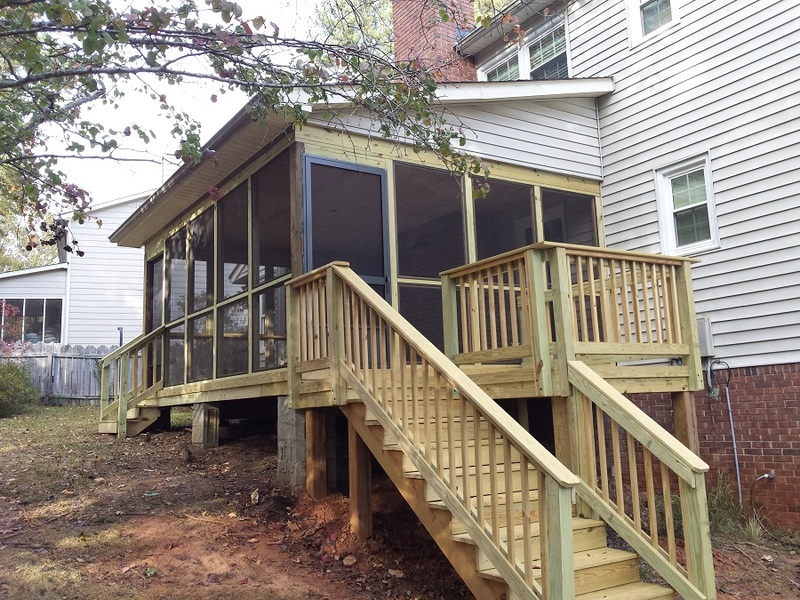 Where some builders would suggest demolition and starting a new porch from scratch, Archadeck of Central GA has the knowledge and experience to provide our customers the greatest value with their budget and lifestyle in mind. This home was built in the 1980’s, as was the existing screened porch. The homeowners felt it was time to remodel and update the space to enhance its aesthetics and increase their enjoyment of the area. Archadeck of Central Georgia was able to save the substructure of the porch and installed new walls, new beams and a new PT floor. We also installed new doors, new stairs and replaced the screening with aluminum screening. In addition, we also tore out the old ceiling due to a leak and installed a new one. A little framing was required once we opened the ceiling. The new ceiling was finished with beadboard as well. The final aspect of this project was the new PT wooden side deck we added to give the homeowners added open-air space and a perfect place for their grill. Much like redecking, the first step in determining if your existing porch or screened porch is a good candidate for updated is to have it evaluated by a reputable Macon or Warner Robins deck builder or contractor such as Archadeck of Central Georgia. If the substructure (the base that the porch is built on) is in good shape, you may be able to save hundreds, or even thousands, of dollars by improving upon your porch’s existing footprint. The key elements we look at during this evaluation are the quality of the original substructure and how it has weathered or degraded over time. We also determine if any applicable building codes have changed since your porch or screened porch was originally built. If we do perform an update, we will make sure to comply with any new codes. 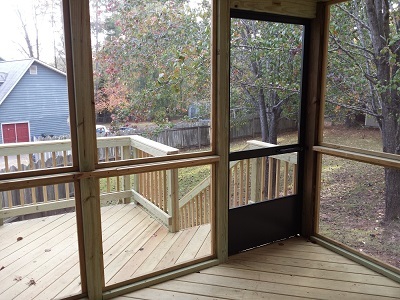 If you are ready to breathe new life into your existing porch or screened porch and add years of outdoor living enjoyment, contact Archadeck of Central Georgia.You can reach us by phone at (478) 745 – 2000 or via email at [email protected].